Inspired by the famous artist Raphael, this classic Raffaellesco Italian ceramic scalloped pasta soup bowl is the perfect addition to your collection of Raffaellesco dinnerware. 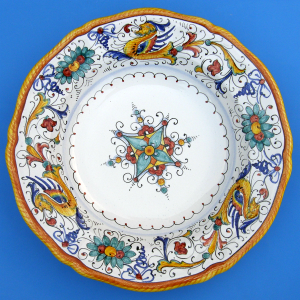 You can also mix and match this bowl with other Italian ceramic patterns. 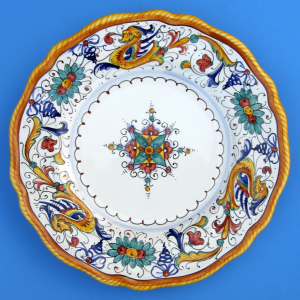 Made in Deruta, Italy, famous for Italian Majolica Ceramics and Pottery. 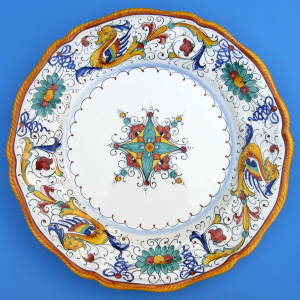 This handmade hand painted authentic Raffaellesco pasta soup bowl measures 9.75" in diameter. With every ceramic shipment, you will receive information about the history, making and care & usage of this hand made handpainted authentic Italian ceramic.